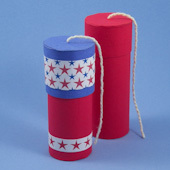 Here in the United States, we celebrate our Independence Day on the Fourth of July with fireworks and noisemakers. This cracker is shaped like a real firecracker and makes a pop without any fire. Best of all, you can use it over and over again! It makes a great party favor or fun gift box for kids. 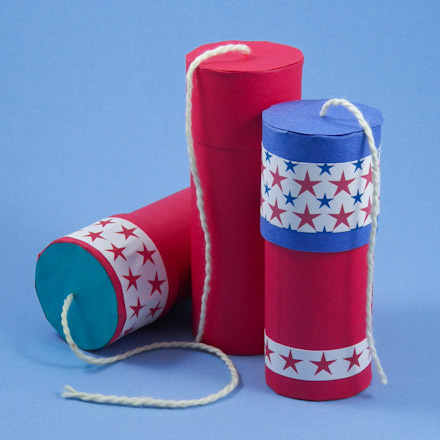 Use it for any celebration, not just the 4th of July. This project is great for family, classroom or group craft time. It requires no patterns and uses simple materials. After a little preparation by the adults or teens, this project goes quickly. Related crafts: To decorate for the Fourth of July, make a Stars and Stripes Pennant Banner. Or make a garland of red, white and blue stars! See the Patriotic Star Garland project for complete instructions. 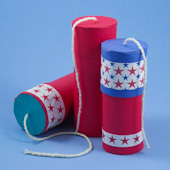 If you are doing this craft with a group of children, pre-cut the tube coverings and the cardboard for the cracker tops. Each child will also need a toilet paper tube and a length of string or yarn. The other supplies and tools can be shared. Cut a circle of cardboard to cover one end of the toilet paper tube. First, carefully trace around one end of the tube onto a piece of cardboard—cardboard from an empty cereal box works well. Now cut out the circle, being careful to cut on the line. Tape the circle in place on one end of the tube. Start by standing the tube on end, and placing the circle on top of the tube. Next, wrap a piece of masking tape around the tube with about half extending above the tube. Snip the tape above the tube in several places, then fold the tape over to hold the cardboard circle in place. Smooth the tape to remove any air bubbles or bumps. Cover the tube in red paper. Measure the length of the tube and its circumference (length around). In the US, this is usually 4½" by 5" to 5½". You can measure around the tube with a tape measure or just use a string and then measure its length. Mark a rectangle on the red paper that measures the length of the tube by the circumference. Cut out the rectangle. Wrap it around the tube to see that it fits, and then glue it in place. It is important that the paper is firmly attached to the tube, especially near the open end. Tip: It's easier to make a complete and thin layer of glue by spreading it with a foam brush. Make a tube for the top of the cracker that fits snugly over the cracker bottom. Cut a rectangle of cardboard that is 1" to 1½" (20 to 30 mm) wide by the circumference of the tube long. Wrap the cardboard around the tube with the cut ends just meeting. Make sure it fits tightly but can still be moved up and down. If it is too loose, trim the cardboard. If it is too tight or the ends don't meet, cut another piece of cardboard. Keep adjusting until you get the right fit. A snug fit is important! Tape the ends of the cardboard together to form a tube and test the fit one more time. Close the end of the top and cover it with red paper (see steps 2-4 above). 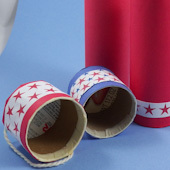 Cut a circle of red paper (or any color you like) to fit the top of the tube, and glue it over the cardboard circle. Tip: Another way to make the top is to start with a cardboard tube that fits over the toilet paper tube. Cut a ring that is 1" to 1½" (20 to 30 mm) wide. Adjust the size for a snug fit by snipping a section out of the ring and taping it back together as above. Test your cracker and make adjustments. Put the cracker together—slide the top as far as you can onto the bottom. Wrap your hand around the top and pull off quickly. Did it pop? If it did, great! You can go on to the next step. If not, try again. If you can't move the top or find it very difficult, your top is too tight and you need to make a new one. If the top isn't too tight and it still doesn't pop, you probably need to make the top fit more snugly. Either put a strip or two of tape around the inside of the tube, or make another top. Add a fuse and fill your cracker with goodies. Use the tip of the yarn needle to punch a hole in the center of the cracker top. Cut a 6" (15 cm) length of string or yarn. Thread it through the yarn needle and tie a knot in the long end. Push the needle through the hole you made. Push it from the inside of the top, then pull the string tight. Tape or glue the knotted end of the string inside the top. That's it! 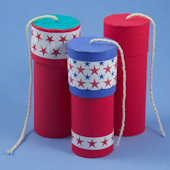 Now fill your cracker with goodies, confetti, or anything else you like. 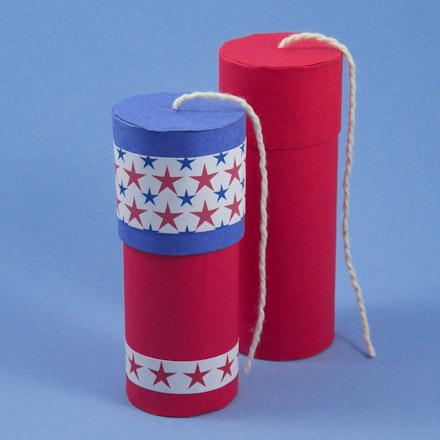 Tip: Make solid-color crackers, or decorate with patriotic paper or stickers. Tip: Print Aunt Annie's Red and Blue Star ePapers, cut strips and glue to crackers. Tip: Cover the top of the cracker with a paper circle in a matching or contrasting color. Tip: If the top is a tiny bit loose, apply a round or two of masking tape around the edge. Do this before covering the top with paper.